Concise Learning teaches students how learn and be successful, helping them pave a new and exciting direction in their lives. 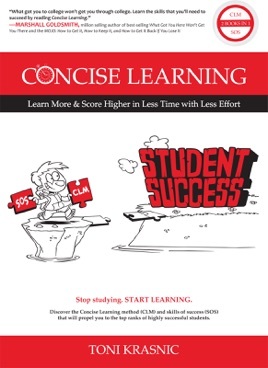 Far more than just a “how-to-study” book that outlines a few study skills, Concise Learning is a step-by-step guide to help high school and college students learn better and faster, get better grades, and become successful, both academically and in life. This is the only book that teaches students the two critical prerequisites for success in school and life: mastery of contentthrough the Concise Learning method (CLM)and mastery of essential skillsthrough the Skills of Success (SOS). Although substantive and comprehensive, the book is written in a light-hearted and conversational style with cartoons, visual maps, and inspiring quotes. Concise Learning is the rare book that will change how you learn and transform how you live. What a fun read! I'll be going back to SOS mind maps over and over again. This book truly has the potential to vastly improve how students learn. Every student whether in high school or college needs this book!